Put your name on the waiting list! There are almost always a few last-minute cancellations. Mail a completed registration and check to the address on the form. Your check will not be cashed unless space opens up and we confirm with you. Click the link below and print a registration form. See the Color Challenge page for more details! Celebrating 20 years! 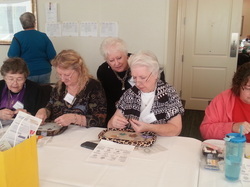 A gathering of friends, old and new, who share a passion for the art of beading. 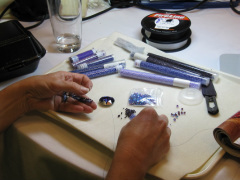 Texas Bead Retreat has always been an informal get-together to bead, visit and share knowledge. Bring a project to work on, take short classes from other participants, who volunteer to share their knowledge freely, or simply chill out and absorb the great bead energy. Our goal: To be unstructured and creative and -- most of all -- to have fun! You'll meet new people, savor the passion for beads that we all share and renew your creative spirit. The event begins with an optional early bird Thursday start. Regular retreat activities begin on Friday. Open beading space is provided in the large ballroom with classes and meals in separate rooms. Registration opens September 1, 2018. Registration Fee includes five meals (Friday dinner through Sunday breakfast), meeting room fees, and classes. Does not include lodging. 2019 registration fee is $215. Watch this page or follow us on Facebook for updates. Host Hotel is the Hilton Garden Inn. A block of rooms at a discounted rate will be reserved until Dec. 26. Be sure to ask for the Texas Bead Retreat rate. $97 King, Double or Junior Suite, plus tax, per night. If booking 3 or more to a room, rates may be slightly higher. Handicap rooms are available but are in limited supply so please book early. All classes are taught by fellow beaders who volunteer their time to teach us new projects. Classes are usually about two hours. Everyone can sign up for three classes. But since the spirit of the retreat is that we share our knowledge with each other, we all pass on what we learned to our tablemates. So you'll spend the weekend learning a variety of projects from bead weaving to metal work. Check out our 2019 Classes by clicking the link in the navigation bar. 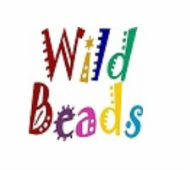 Lori Clarida, of Wild Beads in Arlington, Texas, brings a wide variety of beads and supplies to fill your beady needs for classes and beyond. Grand Prize - a pair of Craft Optics Magnifying Telescopes!